Gnats are members of the fly family. Other names for gnats include no-see-ums, midges or flies. This small insect has wings, and some gnats bite, eat plants, eat other bugs or feed off blood depending on the species. They lay their eggs anywhere. Adult gnats typically are from 1 to 3 mm long. Some female gnats, including black flies and black gnats, eat blood, spread disease and carry parasites. Male gnats usually gather together in mating swarms or ghosts at dusk. Black gnats have more than 1,000 species across the world. This type of gnat is hardly black, but has a dark appearance. 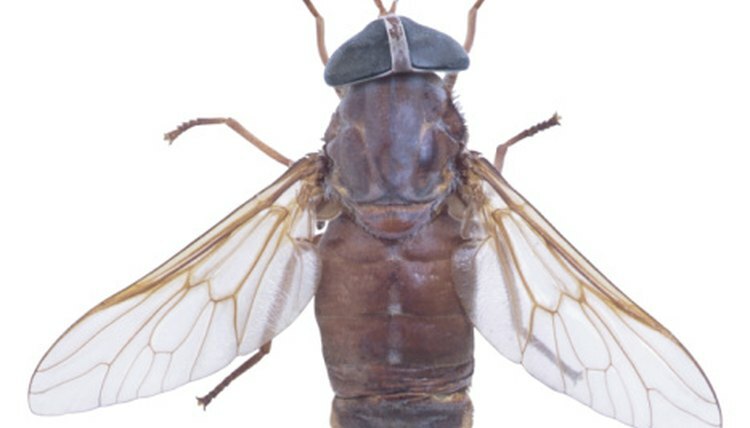 It is a biting fly that has antennae and short legs. Black gnats will bite humans, typically when it starts to get dark. They like to eat flower nectar. They lay their eggs near streams or bodies of water. House plant gnats are black flies that measure about 1/8 inch. This type of gnat likes plants and will eat the plant roots and root hair. It is usually dangerous to small plants, especially over-watered houseplants that have grown fungus. House plant gnats typically live for about eight days, but the female can lay about 300 eggs at once. Another name for a house plant gnat is fungus gnat. Midges are gnats that look similar to mosquitoes, but they do not bite. Midges appear yellow, green, brown or black and grow from 1/8 inch to 1/4 inch in length. They breed close to canals, clogged gutters, ponds and damp areas. They don't breed inside buildings, but will invade buildings in a large group. Midges typically fly in large groups during the daytime. This type of gnat likes bright lights and appears along windows of buildings. Additionally, midges will hang around outdoor lights such as porch lights or security lights. By opting for a soft yellow light rather than a bright white light, you can lessen the midges’ attraction to the light fixture. Drain flies or sewer flies hang around drainpipes or sewers frequently, and often these gnats can indicate the property has a plumbing problem. Both types of gnats or flies reproduce in sewers or drainage systems. However, this type of gnat can reproduce in organic matter in the late stages of decomposition. In order to control the infestation, you need to eliminate where the gnats breed. Simply poring bleach or spraying pesticides in the drain or sewer will not stop the gnats. When the breeding source is in the plumbing break, you need to repair the break and remove the surrounding contaminated soil.